There is a butter shortage in France, which is most definitely affecting the die-hard fans of croissants. The New York Times published an article recently, "France, Land of Croissants, Finds Butter Vanishing From Shelves," stating that, with numbers from the International Dairy Federation, France consumed about 18 pounds of butter per capita last year. That’s more than one pound of butter each month, and according to the article, it is more than three times the consumption of butter in the United States. With this in mind, the butter shortage is a big deal for France. Furthermore, the New York Times continues by saying there has been pressure on the butter market worldwide due to an increase in demand and a reduction in supply. Therefore, prices have risen to more than triple during the past year, and since France’s retailers negotiate prices once a year, in February, they have not been able to meet the suppliers’ price increase. As a result, butter shelves in many supermarkets are almost empty. Fortunately, no one dies from not being able to consume butter. There are countries, though, where food shortages do take a significant toll on the population. Empty shelves in supermarkets and not being able to access essential food items become a normality. Cases like these are profoundly troublesome and such is the current situation in my home, Venezuela. After more than 15 years of enduring an authoritarian government that has promised and vowed to spread wealth equally across its population of 31.5 million, Venezuela has reached its most profound crisis ever. Considering how Venezuela has one of the largest oil reserves in the world, it is complicated to fathom and explain how the country got to where it is today. However, the situation right now is exceptionally intricate with Venezuelans dying of hunger. Not only would you not be able to find butter in the supermarkets, but you would also not find milk, eggs, flour, rice, sugar, chicken, toilet paper, and medicine, which are all conventional everyday products. If one is fortunate enough to get inside of a supermarket at any time and find one of these articles, prices are unfortunately too steep for most of the population to obtain. The result? Hunger, malnourishment and, in many cases, deaths. According to CNN, food prices rose 1000 percent last year, and the average person living in poverty have lost about 19 pounds in weight. In late August, the Guardian reported an increase in acute child malnourishment from eight percent in October of last year to 12 percent now in July. They note that ten percent marks the threshold for a severe food crisis, while if the number were to reach 15 percent, the country would be considered to be in a state of food emergency. It is sometimes interesting then to put things into perspective. 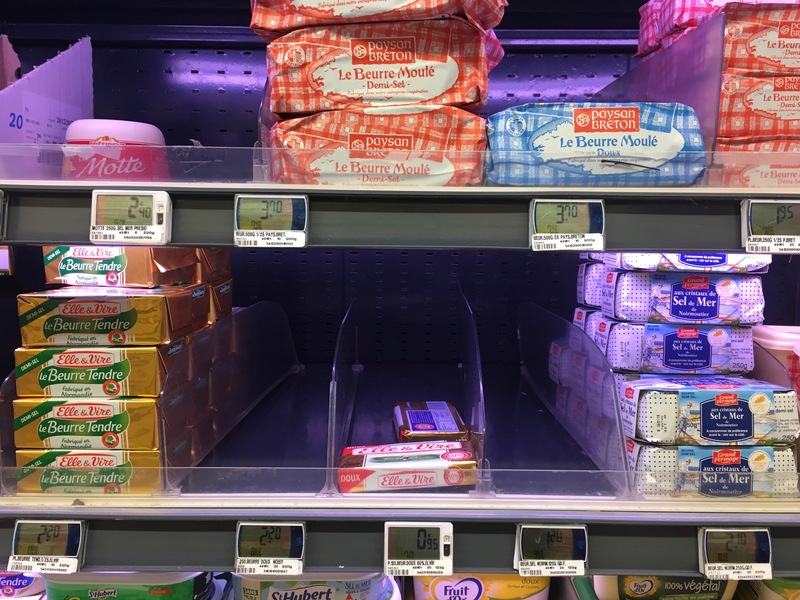 A butter shortage in France doesn't seem like a big deal when compared to the daily struggle of the Venezuelan population. If humanity is fair and the world just, shouldn't people start worrying about the situation in developing countries? Perhaps people aren't aware of what's taking place in the Third World, but the process begins by informing others. Maria is a 20 year old Venezuelan who is majoring in Global Communications. She's passionate about fashion, social media and always on the hunt for the next biggest trend. You can always find her with a glass of wine in her hand in a Parisian café.